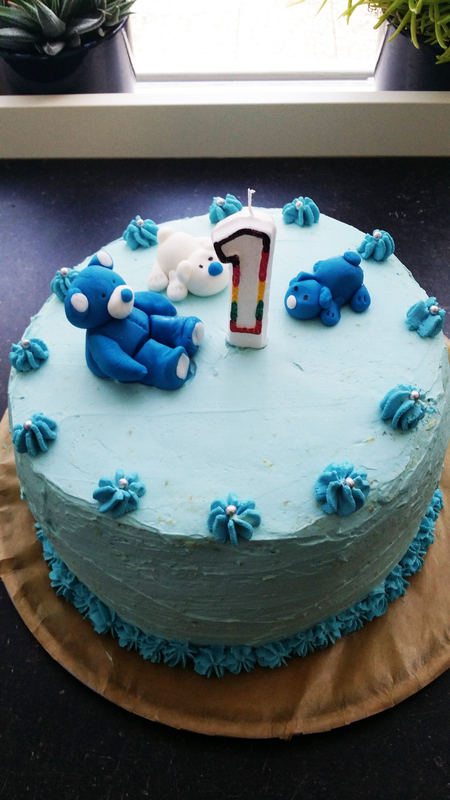 My son’s first birthday was a great opportunity to make this cake. Ever since I saw it the first time, I wanted to make it. I divided my work into 3 days, first baked the layers, then soaked them with punch, layered the cream and let it be in the fridge overnight and then on the day of my son’s party I have decorated it. It was totally worth this much of time. It looked wonderful and was very, very tasty. Found the recipe here. Enjoy! All the ingredients should have a room temperature. Mix and sieve the flours. Separate egg whites from egg yolks. Whisk the egg whites (do not overdo it). In the end add sugar, spoon by spoon. Add egg yolks, one by one. Add flour to the egg mass, gently mix until incorporated (careful to not destroy whisked egg whites). 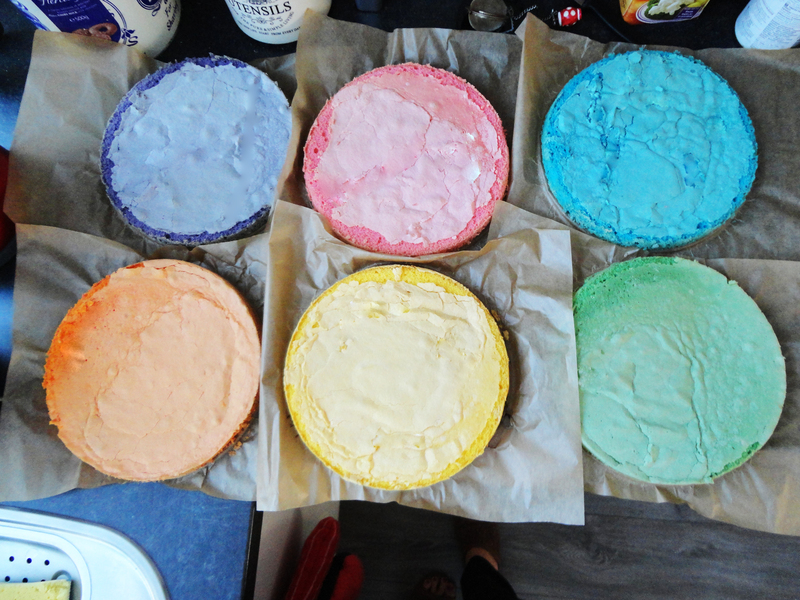 Divide the batter in two, add a tiny bit of the food colouring and mix gently. Line two equal in size baking forms with baking paper (only the bottoms). Gently move the batter into them. Bake at 160ºC for 20-22 minutes or until the cake tester is clean. Take out hot biscuits from the oven and drop them (with the forms) on the floor from about 60 cm. Cool down in the room temperature. Then remove the biscuits and repeat the entire procedure 2 more times. Place full cream and mascarpone in the bowl and beat it. In the end add sugar and lemon zest. Pour the lemon juice into a glass and add water till you get ½ or 2/3rd of glass of punch (as desired). 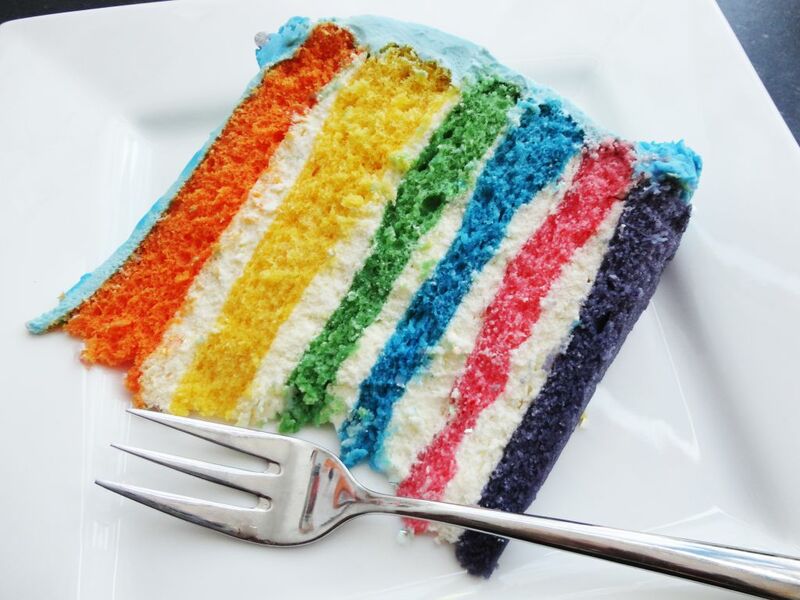 Each layer of cake soak with a punch and spread some cream on it. 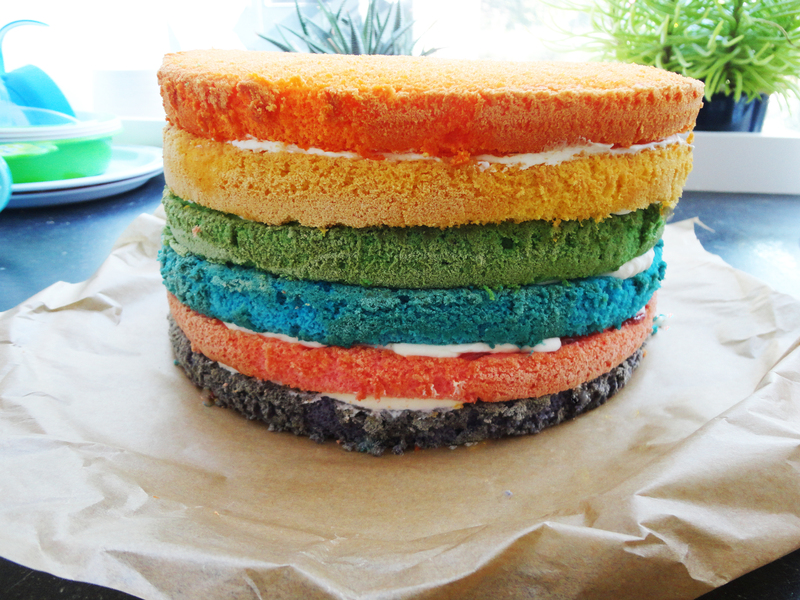 Remember that the base of cake cannot be soak too much (might get very thin because of the weight of the entire cake). 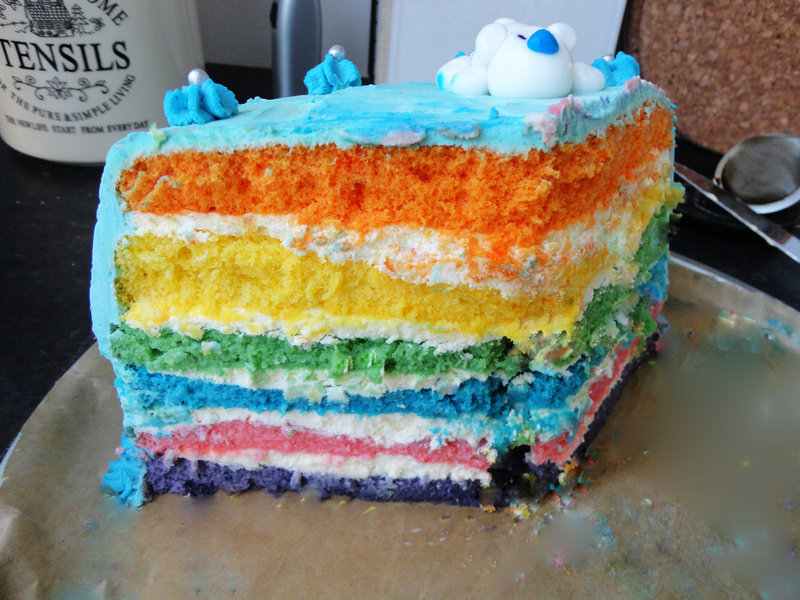 Side and top of the cake also decorate with cream (in my case it had a little of blue food colouring in it). 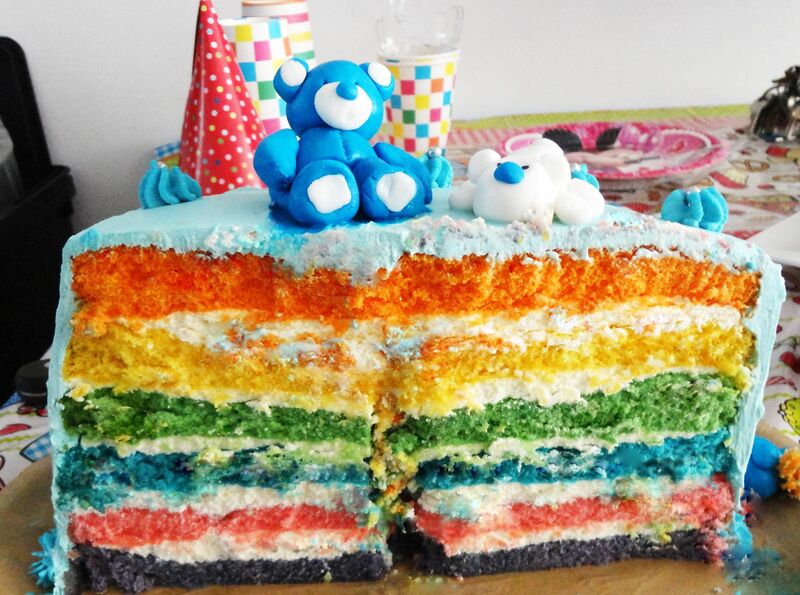 Refrigerate the entire cake at least 3 hours before serving. You should try. It’s worth it!